A load of basic essentials for the International Space Station and its resident crew -- food, fuel and supplies -- launched aboard a Russian-made cargo freighter today. The Progress spacecraft blasted off atop a Soyuz booster from the Baikonur Cosmodrome in Kazakhstan at 11:35 a.m. EDT (1535 GMT), soaring into a clear sky at sundown. At the moment of launch, the station was flying about 220 miles over the South Atlantic. A preliminary orbit was achieved after a nine-minute ascent provided by the three-stage rocket, and onboard commands were issued to unfurl the craft's communications and navigation antennas and extend two power-generating solar arrays that span 35 feet. A series of precise engine firings scheduled for later today and again on Thursday will guide the freighter toward its automated docking Friday at 12:58 p.m. EDT (1658 GMT), marking the 38th such cargo craft received by the station. The 24-foot long ship will link up with the aft port on the Zvezda service module, a spot vacated by a Soyuz crew transport that was repositioned to the Rassvet compartment on Monday. Today's launch is known in the station's assembly matrix as Progress mission 38P. 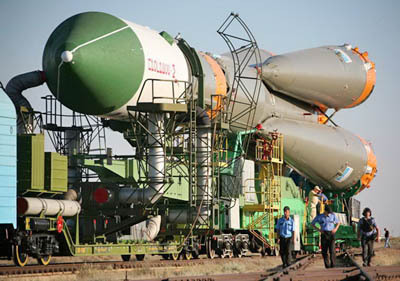 The spacecraft's formal Russian designation is Progress M-06M. The cargo-delivery vehicle is hauling two-and-a-half tons of supplies to the station. The "dry" cargo tucked aboard the Progress amounts to 2,667 pounds in the form of spare parts, life support gear and equipment hardware. The refueling module carries 1,918 pounds of propellant for transfer into the Russian segment of the complex to feed the station's maneuvering thrusters. The vessel also has 220 pounds of water and 110 pounds of oxygen and air. It'll remain attached to the station for two months. The space station is staffed by the Expedition 24 crew of commander Alexander Skvortsov, Russian cosmonauts Mikhail Kornienko and Fyodor Yurchikhin, and NASA astronauts Tracy Caldwell Dyson, Doug Wheelock and Shannon Walker. The cosmonauts will be standing by Friday to take over manual control of the approaching Progress spacecraft if the autopilot experiences a problem. Orbit Insertion 0/00:08:45 11:44:00 a.m.
(15.50 m/s) 0/03:35:03 3:10:18 p.m.
(7.28 m/s) 0/04:33:50 4:09:05 p.m.
(2.00 m/s) 1/00:57:48 12:33:03 p.m.
(26.353 m/s) 1/23:20:41 10:55:56 a.m.
(1.245 m/s) 1/23:43:24 11:18:39 a.m.
(22.569 m/s) 2/00:06:49 11:42:04 a.m.
(Range 80 km) 2/00:12:05 11:47:20 a.m.
Orbital sunrise 2/00:23:31 11:58:46 a.m.
(Range 15 km) 2/00:33:05 12:08:20 p.m.
(Range 8 km) 2/00:40:05 12:15:20 p.m.
(6.467 m/s) 2/00:48:00 12:23:15 p.m.
(5.269 m/s) 2/00:52:24 12:27:39 p.m.
(2.307 m/s) 2/00:54:56 12:30:11 p.m.
Start stationkeeping 2/01:04:45 12:40:00 p.m.
Start final approach 2/01:11:45 12:47:00 p.m.